The MT91 Series from Newage is an automatic microhardness testing system that uses the Rockwell method for the hardness result. Hardness is measured based on the depth of penetration, rather than an optical system that determines based on the impression diameter. The MT91 test cycle is so fast that you can use it for process control – not just quality control. Test reliability is improved since there is no human interpretation of the impression measurement, so operators no longer need to maintain such a high skill levels. Mounted test samples no longer need the same high level of preparation – or even mounting in some cases. Your case-depth analysis has now become much easier. Setting up to test multiple specimens is simply point and shoot. You can set up as many as 24 traverses as part of a single procedure. Complicated staggered traverse procedures are easily created with the graphic setup utility. 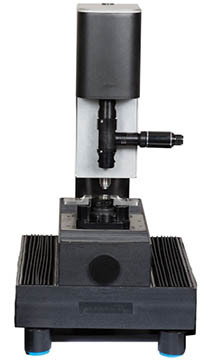 Learn more about the MT91 microhardness testing system on www.hardnesstesters.com.